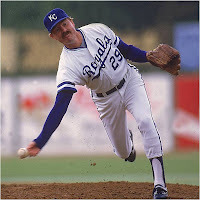 It may seem like 3 lifetimes ago, but the Kansas City Royals were once a powerhouse. 6 out of those 10 years there were only 4 playoff teams all together. In other words they didn't take advantage of a Wild Card to get in. Alas in the 26 seasons that followed, the Royals haven't played in another post season and have contended only once since the 1994 strike. In other words they have become the Pirates of the American League. Once mighty, now a farm team for the rest of baseball. Now of course the team has a ton of young talent and if the small market Twins could turn things around and go on a playoff run, then anything is possible. But as I continue my "Pitchers who clinched a post season series" I decided to check Kansas City off the list. Because they've only won 3 playoff series in their history and I figured this would be a quick one to get out of the way. 3 2/3 innings of relief Paul Splittorff for the win. 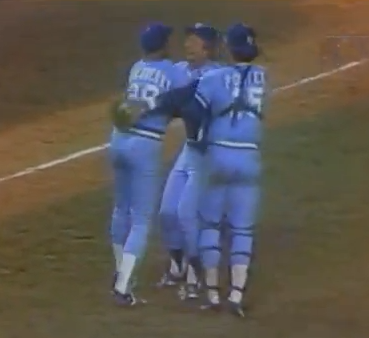 LAST OUT: Willie Randolph called out on strikes. 2/3 innings of relief of Bret Saberhagen and Charlie Leibrandt. LAST OUT: Lloyd Moseby grounds out to second baseman Frank White who threw to first baseman Steve Balboni for the out. Complete Game 5 hit shutout. LAST OUT: Andy Van Slyke flies out to right fielder Darryl Motley. There you have it. The two pitchers who experienced that great post season moment for a once proud franchise. To read the other entries, here's the one for the Phillies and the Red Sox. 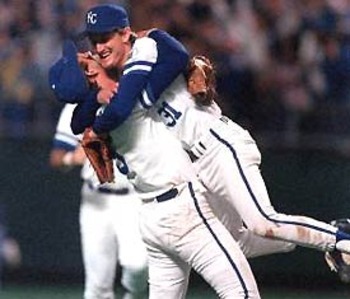 It's been too long since a clincher, Royals. I want to add Joakim Soria to this list. that first picture in the beginning looks a little a little bit old, but hey I liked this post too, very informative, thanks bro!